It's winter. It's cold. Unless there is snow no one seems to want to play outside. So you end up with kids who want something (other than school work) to do. 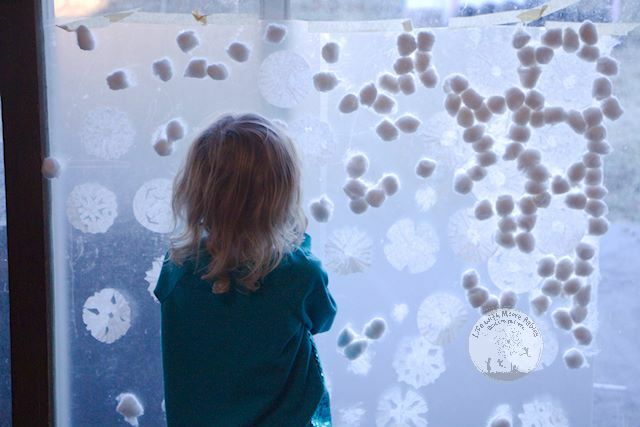 So how do you keep a kid busy inside in the winter? 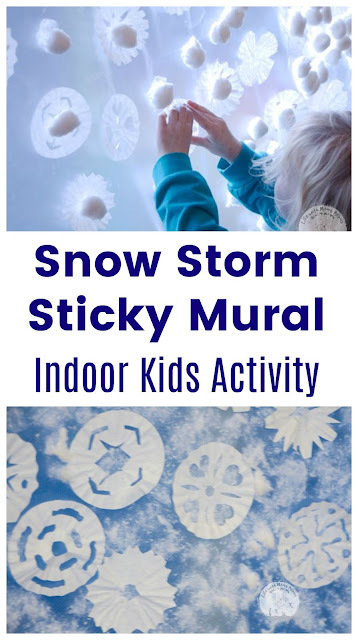 Well, we were able to get all the kids involved with this Sticky Snow Storm Mural! I think some snowflake sequins would be awesome too, but I couldn't find mine. We decided to make our mural on the glass door, so we could see the outside behind. If you have a colored wall it would work there too. We unrolled some contact paper and taped it to the door with sticky side out. 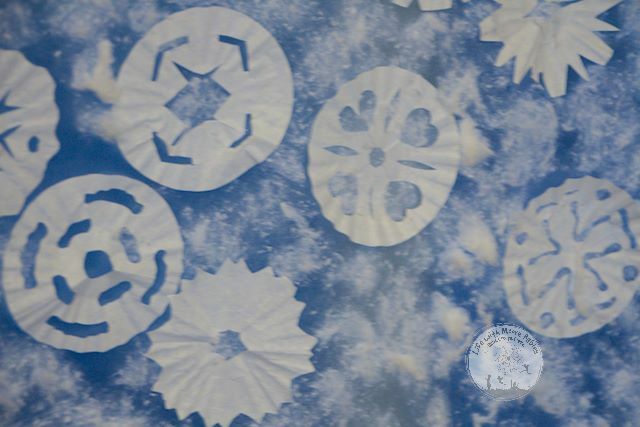 While I was working on hanging up the contact paper, which is harder then you might think because it is sticky, the kids were making snowflakes out of coffee filters. These coffee filters are similar in size to a cupcake wrapper, so they are great for little snowflakes, You cannot put a lot of detail into them though; at least not very easily. Just fold them in half 3 times or so and cut random shapes like you would if you made large snowflakes. The older kids loved this! Obviously I am depriving them of simple crafts when my son asked 3 times where I learned to do this. They just kept cutting! Once we had a few, I let the preschooler start sticking them on the contact paper. I also gave her a partial bag of cotton balls to add to the blizzard. The two older kids kept right on cutting, so amused by the designs they could make, but the 7-year-old decided he needed to stick some on too. And he discovered you could throw the cotton balls at the contact paper and still have them stick! Which he was quick to show his little sister. The cotton ball throwing continued until they ran out. Now they were left with snowflake the girls had continued to cut out. But it wasn't enough. 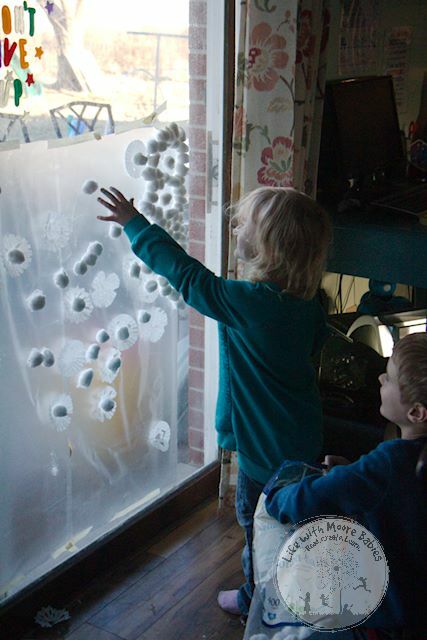 These kids couldn't stop with the cotton balls they had and the never ending snowflakes. They wanted to do it again! So what did they do? Yep, they starting taking cotton balls off. To them, this was the most amazing part of the entire sticky mural! You see, when they pulled a cotton ball off, it left a little cotton behind. Now they had a nice soft area and a cotton ball they could stick somewhere else. So all the cotton balls came off, then got stuck on, then came off again and again and again. The little snow storm sticky mural was turning into an indoor blizzard! 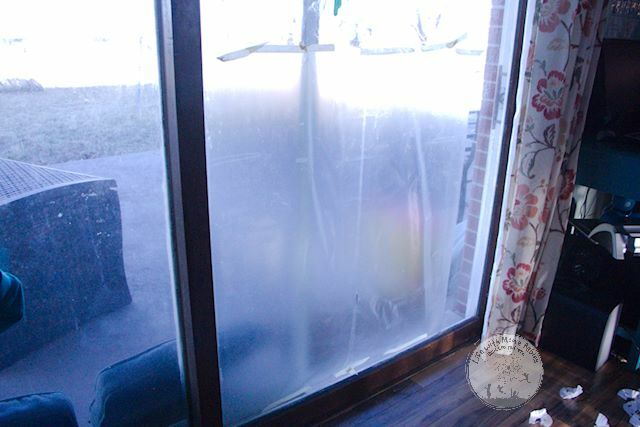 And by the time it was finished, it was definitely a blizzard as you could barely see through our clear contact paper! 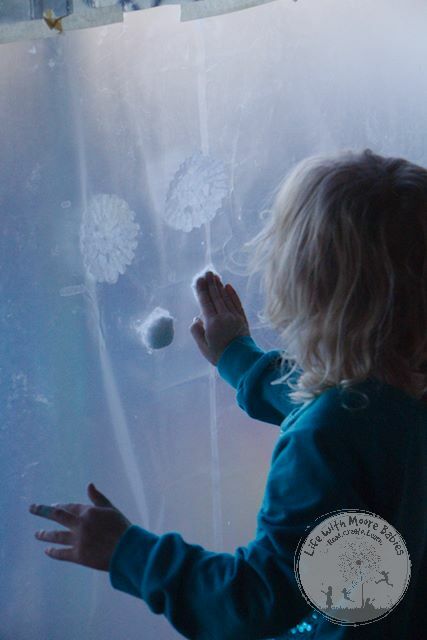 This indoor snow activity was a hit with all my kids! I have a feeling the second half of my door will soon be covered with another snow storm sticky mural. I am not a person who loves "traditions." In fact, I don't think I have ever felt the need to do something because it was tradition. Not that traditions are bad, but I just don't tend to conform to them unless I have a good reason. Still I wanted my kids to have some meaningful traditions. 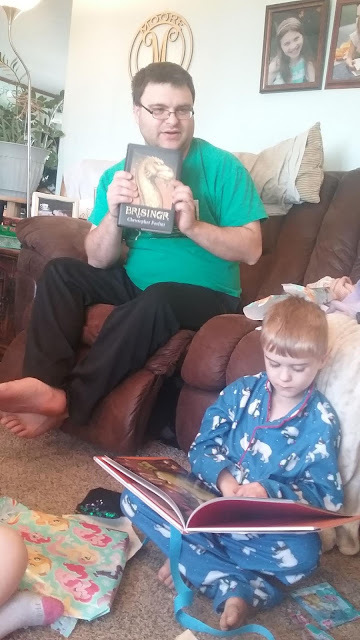 So, a few years ago my husband and I (inspired by Iceland's Christmas book giving tradition) started a new tradition that also functions to encourage reading. 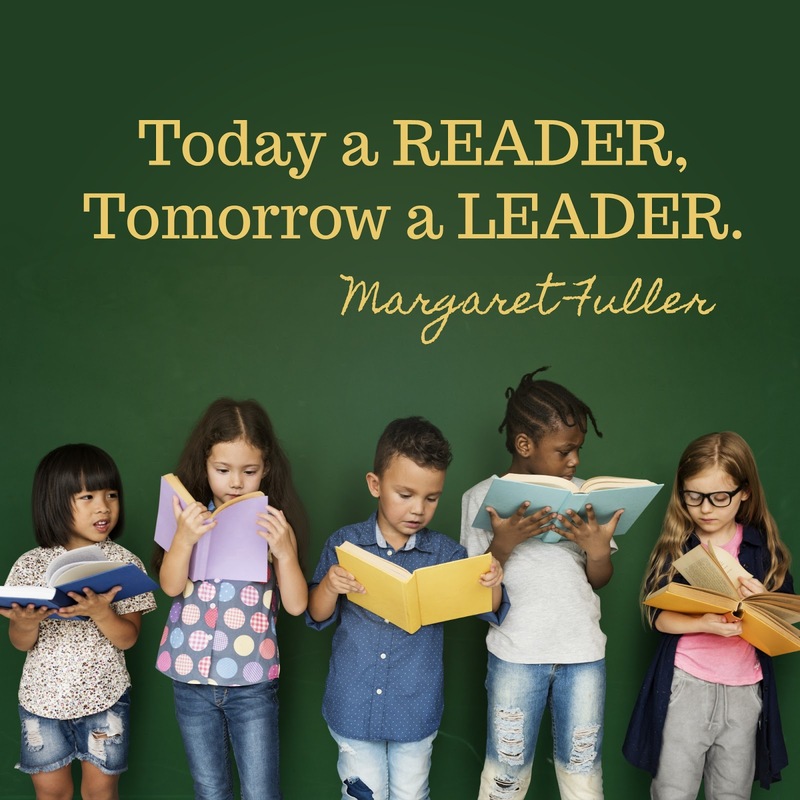 We know reading is important for kids not just for learning facts, but for learning new skills, improving vocabulary, and increasing memory. It also improves social skills! So we know reading is good for kids. 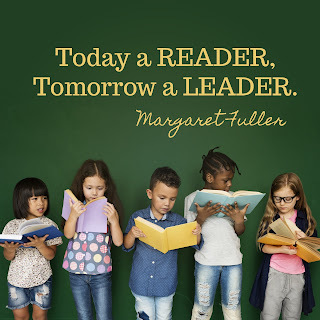 We know they need to read, so how can we encourage reading? In addition to what we already do at our house for beginning readers, we have this New Book New Year Tradition for all the readers (even mom and dad). What is this new tradition you might say? Well it is nothing amazing. It doesn't take a lot of time, a lot of effort, or even a lot of money especially if you are willing to shop used. In fact all you need to do is purchase a new (or new to you) book for each member of your family. If you don't want to pick a book for yourself, you can ask your spouse to. Honestly, my husband will happily shop with me for books for the kids and always prides himself on surprising me with the book he finds. He can get pretty ornery too. He has even swapped out the book I wrapped for myself with one he purchased and hid from me. Once you have your books wrap them up. 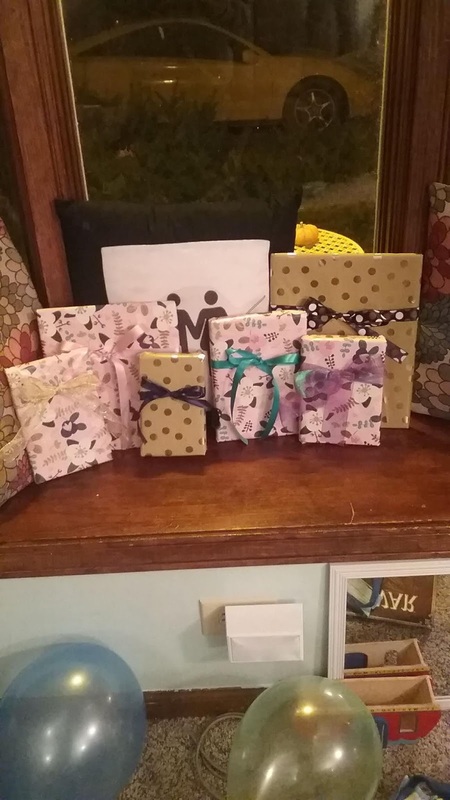 I usually use the same or a couple coordinating papers with a different color ribbon for each family member. 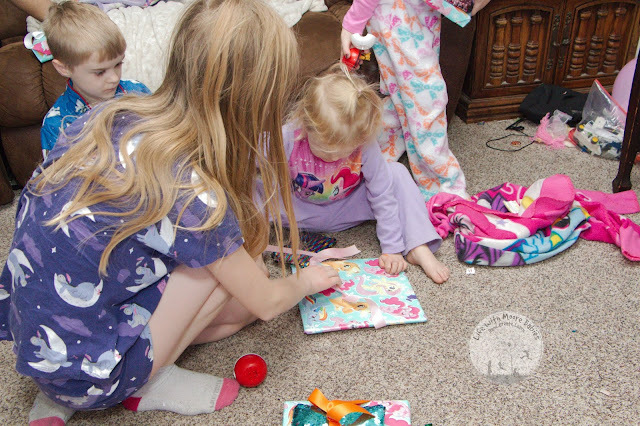 Then right after kids are in bed (or just some time late New Year's Eve when they aren't paying attention) place them in a central position in the house. Now those happy new books are waiting for the new year just like you. When everyone wakes up in the morning it is time to open the New Year's books. Now if you all stayed up the night before this may not happen very early which is a-ok. Of course if you have an early riser you may need to occupy them while waiting for the rest of the family. After all this isn't supposed to be a hectic, wake everyone up for gifts, tradition. Once you have everyone up, you open books, or eat, decide which order is best for your family, Opening doesn't take too long, and while it is the most exciting part, the best part is what happens after the books are open. The kids all look at all the books, not just their own. They want to read them all! The littler ones want theirs read aloud, and several members of the family end up reading to them. After all reading aloud is important. Then the older kids and the adults are able to take time to read or at least begin reading their books. 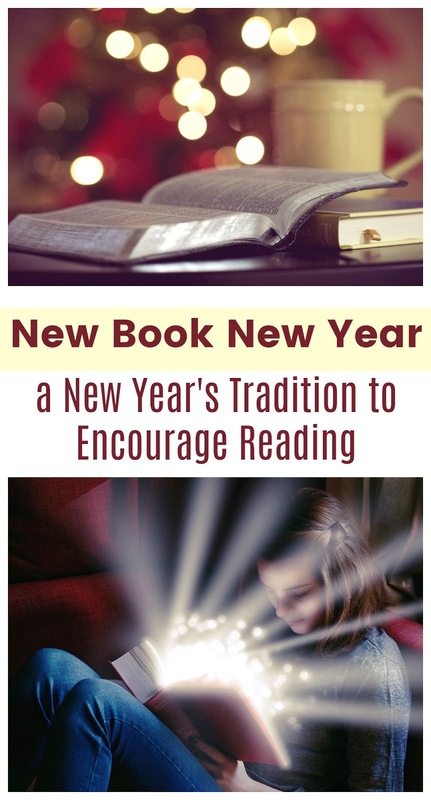 The New Book New Year is a slow, peaceful way to start the new year, and it encourages the kids to start the year reading. The older ones read their books as well as the younger kids books, lots of reading going on for sure. This New Year's tradition also allow mom and dad a chance to have a calm morning and enjoy some reading too. 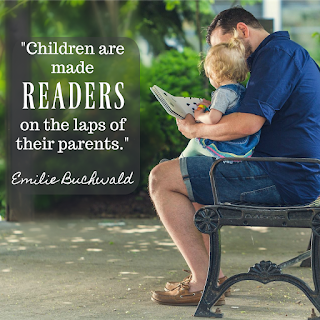 Plus seeing their parents read encourages kids to become readers too. Basically, this is one tradition that I don't have any problem keeping! I also want to introduce you to a great way to encourage reading all year long, the new Usborne Book Subscription Box! That's right, new, age appropriate books delivered right to your door each month. Let my favorite book lady, Janine give you more information about the subscription box as well as about why you should raise readers. 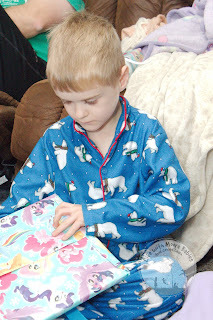 I received a sample subscription box as a thank you for inclusion in this post, because my book lady knows we love books, and Usborne are some of our favorites! Be sure to check out this book subscription box quick because December 31st is the last day to sign up! And if you need a way to ring in your New Book New Year why not try a Book Themed Countdown! We know hands-on learning has many benefits including more student engagement; if you aren't familiar with the benefits of hands-on learning, read more here. But when most people think of hands-on learning activities they imagine complicated projects with lots of parts and lots of mess! 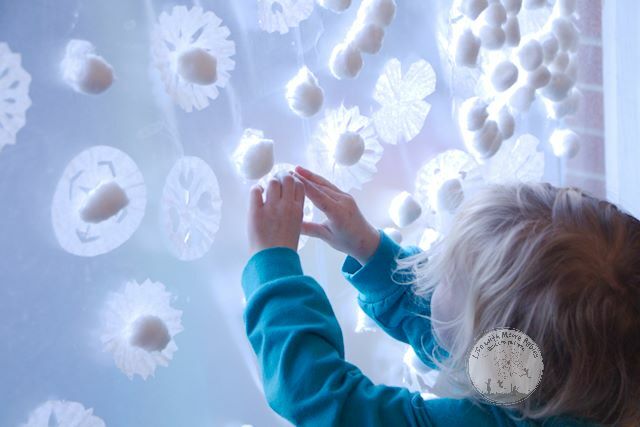 And indeed those are hands-on activities and kids can learn a lot by doing them; however, not every hands-on activity has to be big or complicated or messy. 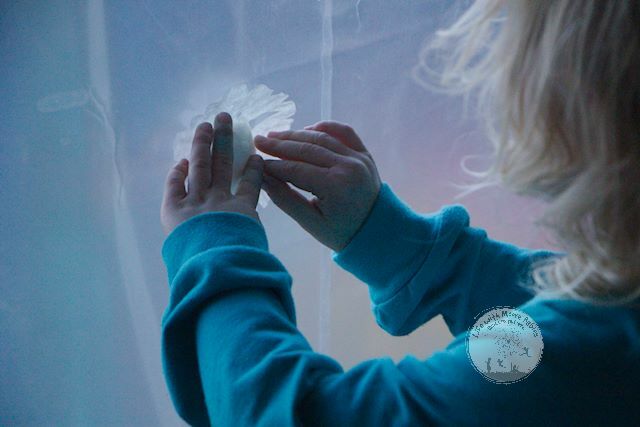 In fact a lot of quick, hands-on learning activities can be created with a few things you can easily keep (and probably already have) at home. Currently our hands-on activities are limited to elementary students, so that is what these are most useful for. But in a couple years I may find myself using the same supplies with middle school students! So now that you have seen our list, are you surprised? 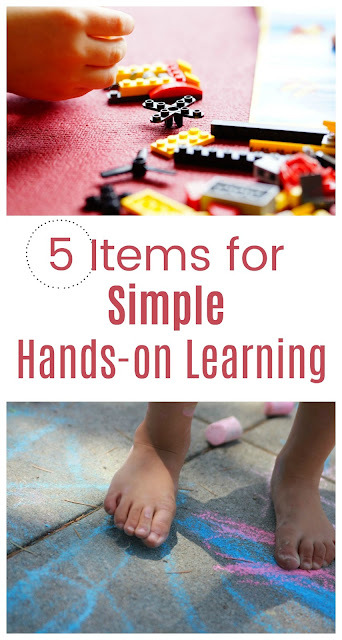 Other than science experiments, we use these 5 supplies for a large amount of our hands-on learning activities. You are probably wondering how. Let's take a look at each one. Sidewalk Chalk - Obviously, this one is more useful in warmer weather, but it is so simple to turn learning into a game with sidewalk chalk. Had it been warmer out our alphabet hop would have definitely featured sidewalk chalk. Use the chalk to write letters, numbers, countries and then have kids hop on them. What kids doesn't like to hop? This can go beyond just recognizing letters and numbers too. Seriously we have practiced rhyming, multiplication, continents, and even musical notation plus numerous other things. 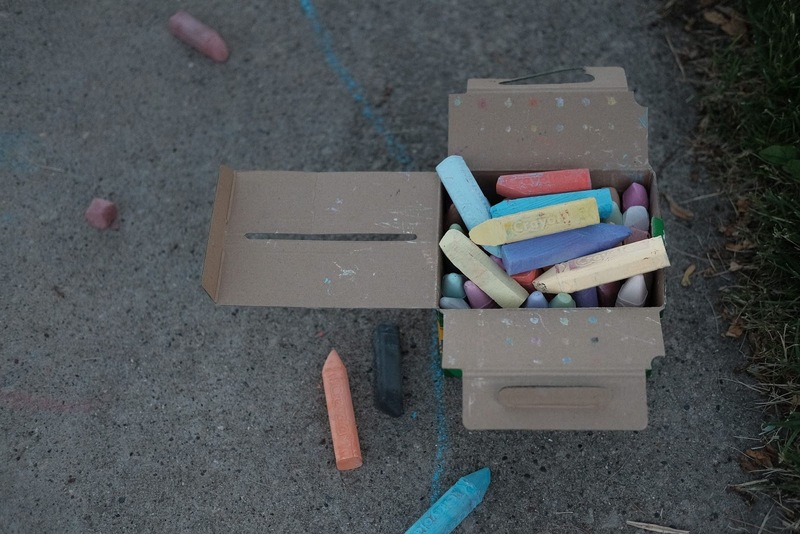 Sidewalk chalk is my go-to hands-on learning supply when we are working on memorization. Dot Stickers - Stickers are magical things. Kids can use them to cover up facts as they practice them like we did here or even fill in dot marker pages. But you can also have even more fun with stickers, especially the dot ones that you can write on. We have mainly used these for letters, but there is no reason you couldn't do the same with numbers or words. We have practiced the alphabet, recognizing vowels, and matching cursive and print letters. 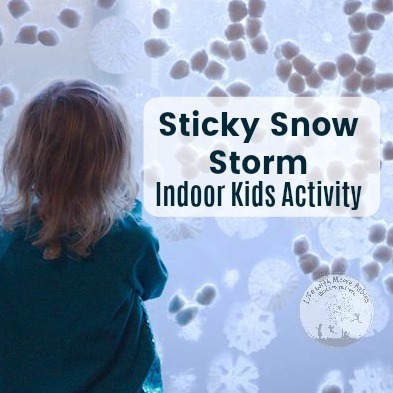 These are great for when you need an indoor activity. We could have easily used them for our basket ball addition too. And they work with toddlers too! 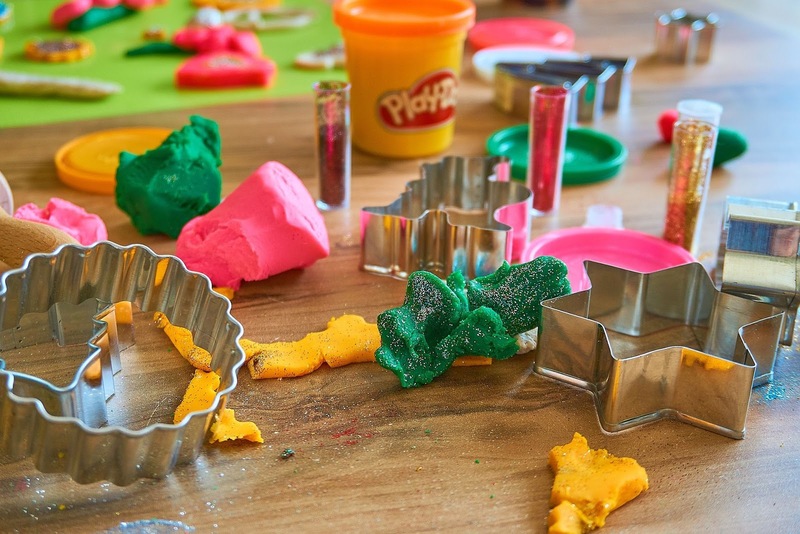 Play Dough - Like beads, play dough is great for increasing fine motor skills, and it is also great for hands-on learning. Even my big kids love play dough. You can cut letters and numbers from it, or make play dough ropes and form letters and numbers. We have also used it for counting, learning about bones, and some art appreciation. You can find tons more ideas for play dough here. Beads - The obvious thing you can do with beads is craft, which is indeed a hands-on learning activity. But you can also use them for counting, learning the calendar, and science projects. These can also be used for sorting (like we used buttons), as bingo markers, and if you have the letter beads, spelling! Really, with such variety you are bound to come up with a learning activity to use them for. Legos - Legos are so versatile. There are the obvious uses for STEM learning, but they are also great for math. Count them, measure with them, practice multiplication with them. You can also use Legos to build historical buildings or scenes or retell a book. And if you used dot stickers like I showed you above, you can now use legos (well duplos) for spelling! 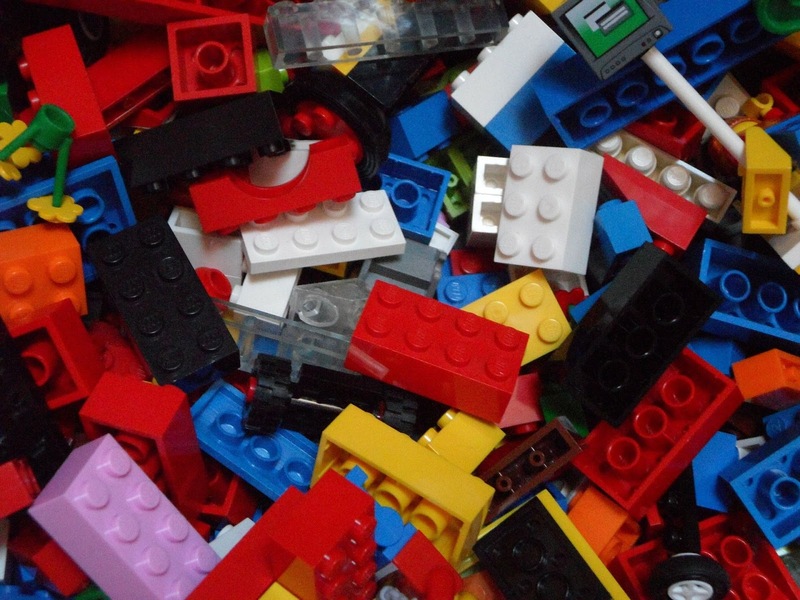 Tons more information on learning with Legos here. More hands-on learning supplies we love, but are just not as versatile, are not used as often, or do not qualify as simple. Toobs - We love these, but they can be pricey if you want them all. They are great for sensory bins and we have used them for animal classification (along with sidewalk chalk). The landmark toob is fun for geography too. Magnetic Letters (or other moveable alphabet) - These are great for practicing letter names, sounds, and spelling. There are magnetic numbers too. Vinegar/ Baking Soda - It is no secret we love science experiments here, and vinegar with baking soda is a favorite. And you can change it by adding food coloring, dish soap, or glitter. So many options! Craft Supplies - Here comes the mess. 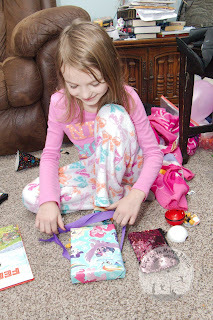 Craft supplies are definitely great for hands-on learning, but I couldn't narrow it down to any specific ones as they all have value for different projects. They have obvious uses for arts and crafts, and also for projects like a Body Map or making cute Pop-up Letter Books. Board Games - So much can be learned from board games. In fact there is as much variety in what kids can learn as there are board games! I definitely think they are must for kids (read more here), but there is no specific one that all kids need. 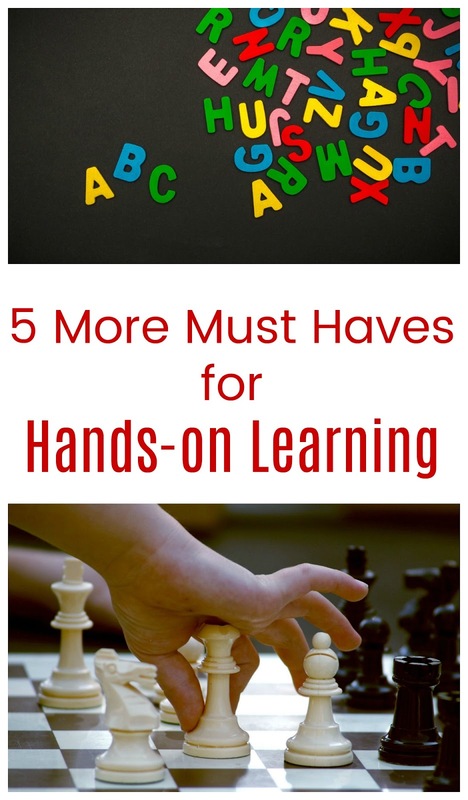 So there you have it; our 5 must haves for simple hands-on learning activities and 5 must haves for not as simple hands-on learning. I am curious to see how our most used supplies change as we move into the middle school years. 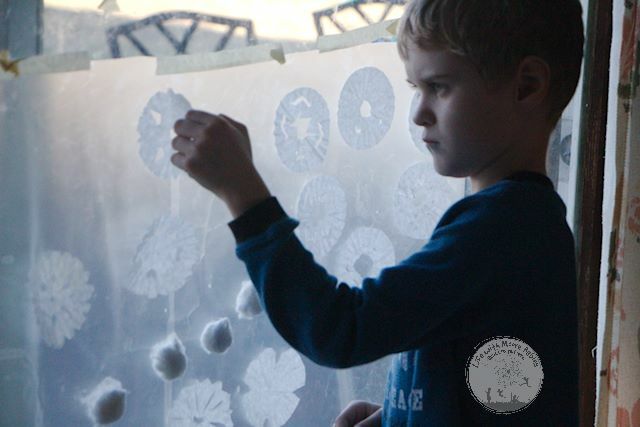 Get even more tips on making Hands-on Learning Activities more manageable here.